Resident Mark Brown and the Turtle Journal team found the first diamondback terrapin nest this year at Sippican Harbor’s Holly Beach. 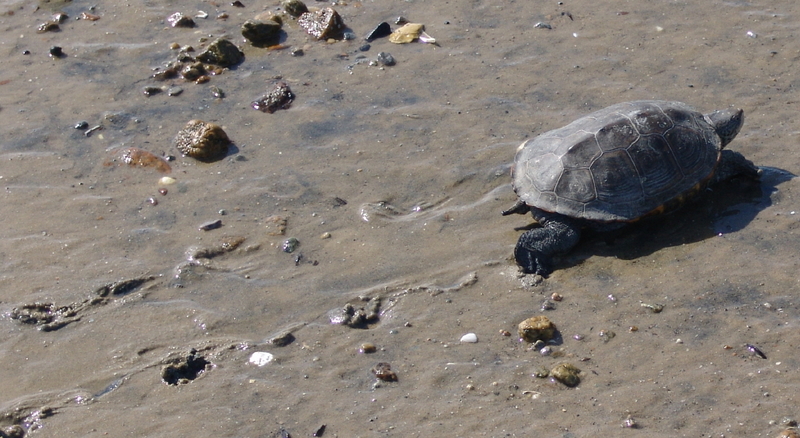 TJ’s Don Lewis, on his mid-morning run, jogged along Holly Beach to check for nesting terrapins. In the distance, Don spotted Mark Brown examining the beach sand. 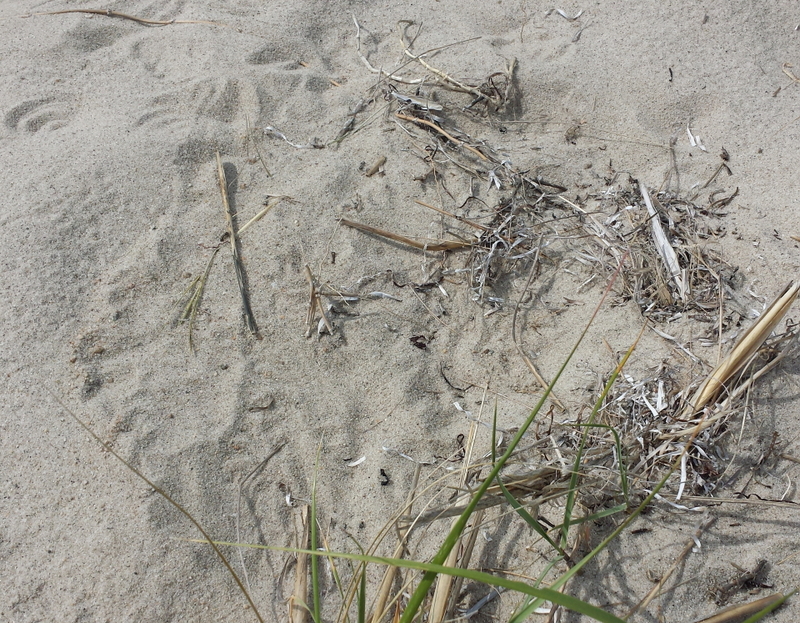 Don pointed out a patch of disturbed and discolored sand, slightly darker than the surrounding dirt. The mother turtle had covered the nest and had disguised it with debris. Within an hour or so, this camouflage would have totally obscured the dig and hidden the nest from everyone … except a predator’s nose. Gently probing the nest with fingertips, Don located the “sweet spot,” the soft soil leading from the surface to the egg chamber. 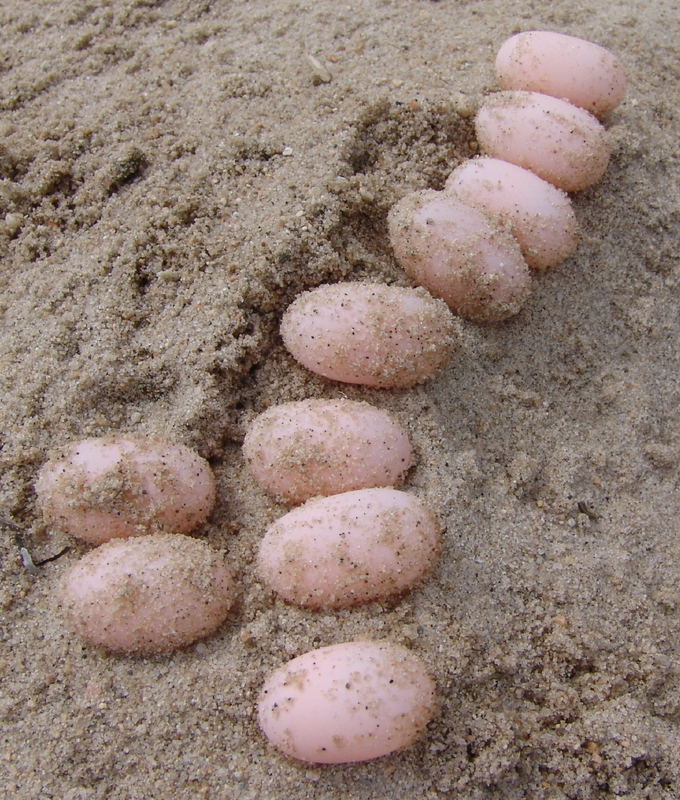 Delicately brushing aside layers of sand to avoid damage to the fragile eggs, Don disclosed the top eggs tucked about three to four inches deep. A total of 10 perfect, pink eggs filled the chamber, each weighing between 9 and 10 grams. This first of the season nest at Holly Beach is the second viable nest ever that we have discovered at this new nesting site. 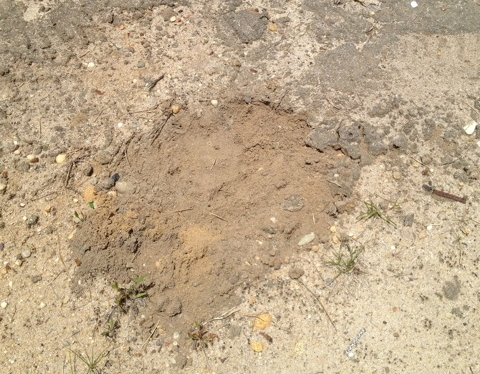 Last July 11th, the Turtle Journal team found Terrapin #272 nesting about 75 feet upland of this June 10th, 2013 nest. See Research “Home Run” with First Protected Terrapin Nest @ Holly Beach. Today’s eggs have been placed in a protected location. With a warm summer and plenty of sunshine, they should hatch in mid-August for return to Holly Beach for release by the community. 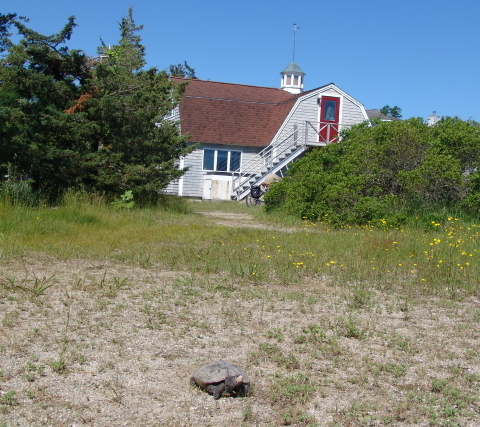 Turtle Journal’s Don Lewis biked to Tabor Academy’s Schaefer Oceanology Lab off Front Street in Marion early Sunday morning to check the uplands abutting Sippican Harbor for nesting terrapins. 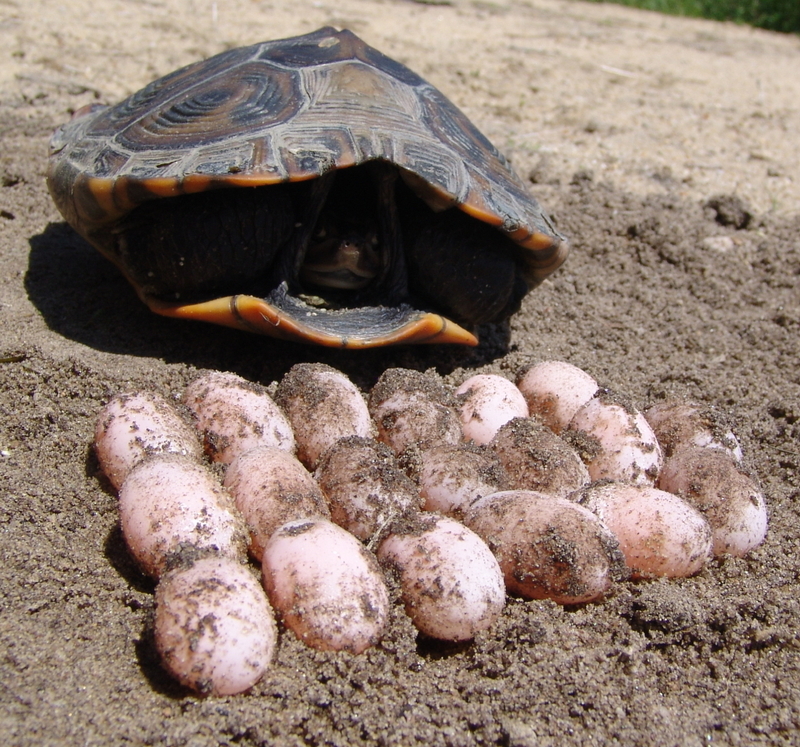 On July 2th, 2012, Turtle Journal’s Sue Wieber Nourse found Terrapin #329 nesting at this site, and she recovered 12 perfect eggs. These rare eggs were protected through incubation, and hatchlings were released back at the nursery salt marsh surrounding Schaefer Lab in September 2012. See the full story with links to the major research discoveries of Sue’s Advanced Marine Science program at Tabor Academy at Rare Turtle Nests at Tabor’s Schaefer Lab. This Sunday morning Don found a new adult female terrapin, #71, on a nesting run behind Schaefer Lab. 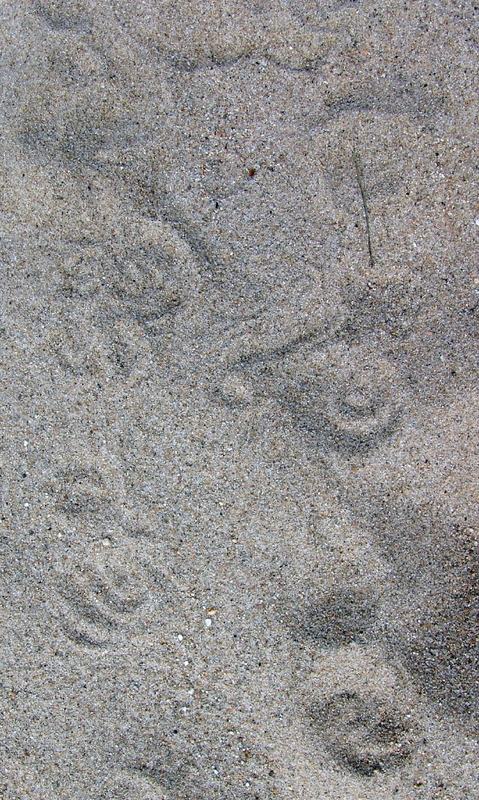 In fact, the precise spot were #71 dug her nest was located within a couple of feet of the place where Sue Wieber Nourse and her students, back in 2003 – 2005, incubated threatened terrapin eggs in a turtle garden under nest protectors and predator excluders. This breakthrough research and conservation initiative was endorsed and funded through a major grant from the prestigious National Fish & Wildlife Foundation, the first of its kind ever received by Tabor Academy. 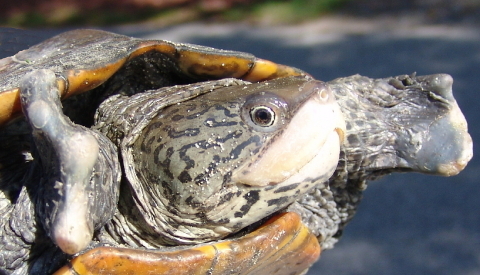 Terrapin #71 is a young, 11-year-old female who already measures 8.2 inches straight line carapace length and weighs nearly 3.5 pounds, placing her in the top few percentile of Buzzards Bay diamondback terrapins by size. After enduring the process of measuring and marking, #71 spritely headed back into Sippican Harbor by way of Tenbrook Beach, a sand-starved spit south of Schaefer Oceanology Lab. An hour later, Sue Wieber Nourse encountered Terrapin #77 nesting on the barrier beach of Aucoot Cove. This turtle dug her nest in marginal nesting habitat mixed with course gravel. 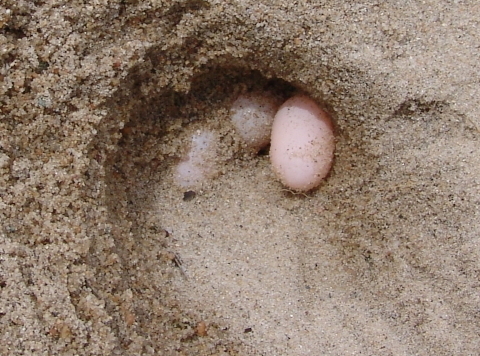 Her eggs were extremely thin and fragile; only eight of her 11-egg clutch were viable. 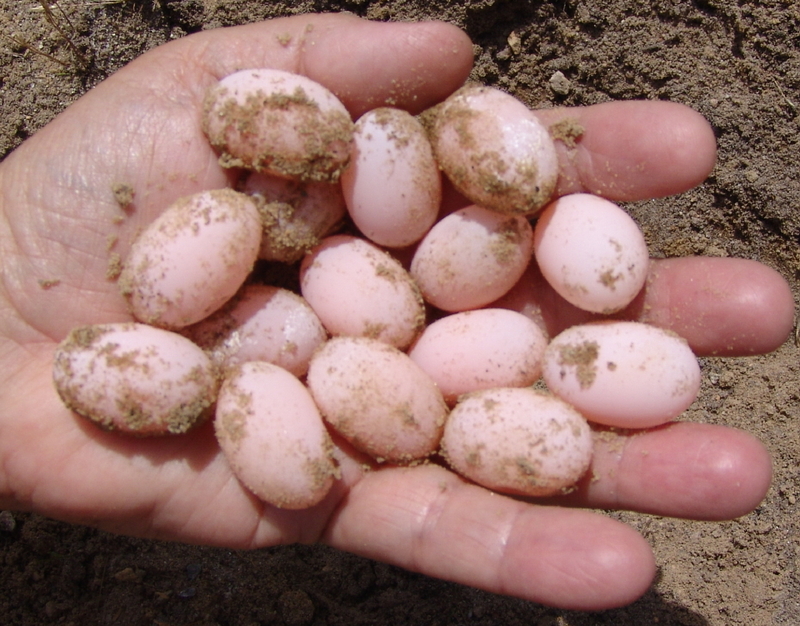 These eggs, too, were taken to the TJ turtle garden where they will incubate until emergence in protected safety. Terrapin #77 is an ancient female of 8.4 inches length and 3.4 pound weight. We first observed her in late June 2010 and then again in early July 2011 nesting in the same area. 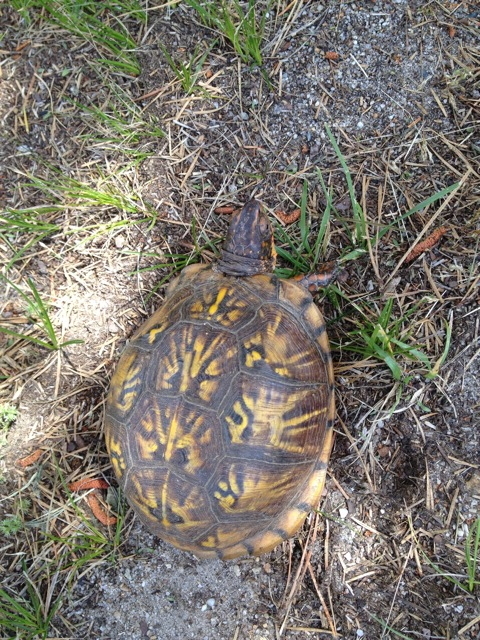 Curt Smith of Wellfleet and Boston discovered this beautiful Eastern box turtle on a nesting run in Wellfleet on Outer Cape Cod June 6th. He kindly alerted Turtle Journal of his find and sent us these photographs, which he authorized us to post for your enjoyment. 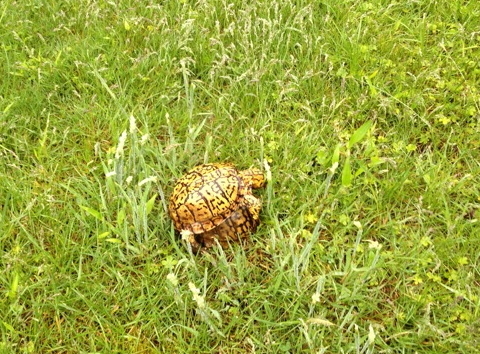 Curt observed this box turtle digging a nest, depositing her eggs and disguising the spot after she finished. Fortunately, Curt took a photograph immediately afterwards, so that we can see the outline of the nest highlighted by discoloration of the soil caused by the moisture of upturned dirt. Within an hour or so, the nest would have perfectly blended into the background, and would have been impossible to detect. 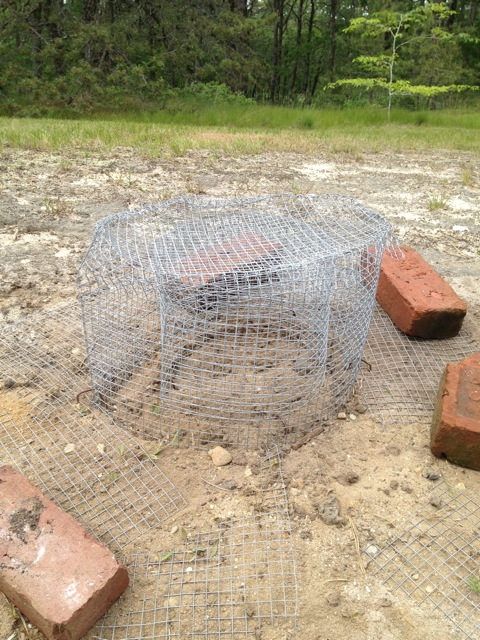 With predators in the area, foxes and skunks and raccoons, Curt protected the nest with a double cage of chicken wire and a chicken wire blanket stretching out from the nest. Before emplacing this protective shield, Curt confirmed the presence of eggs in the nest by gently probing the egg chamber. While clearly not the same female box turtle seen nesting on June 6th, this photograph that Curt snapped two weeks earlier shows the amorous activity that leads to nesting. 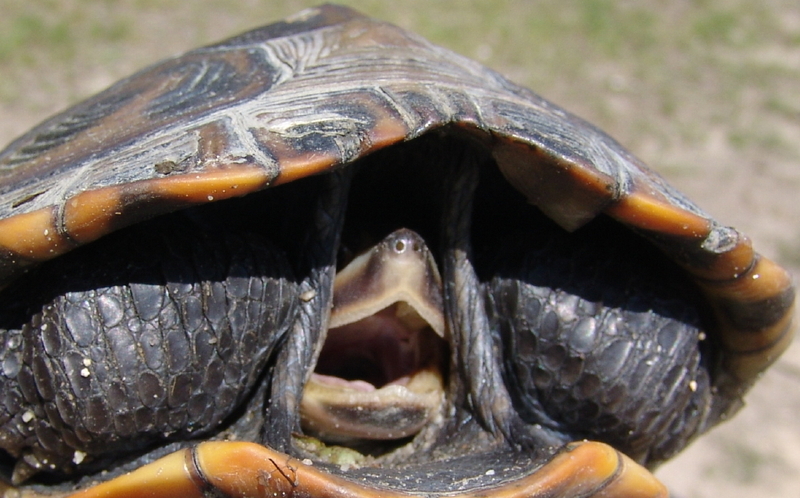 If April showers bring May flowers, then surely May necking yields June nesting … for turtles in the Great White North. 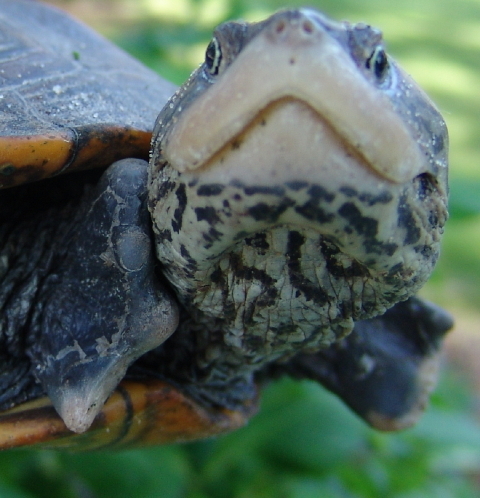 Turtle Journal thanks Curt Smith for his bold action to save the world, one turtle at a time. One of Turtle Journal’s favorite terrapin ladies returned to nest on Thursday morning. This sweetheart, Terrapin #299 whom we have been monitoring for nearly a decade, has lost both front limbs below her wrists. 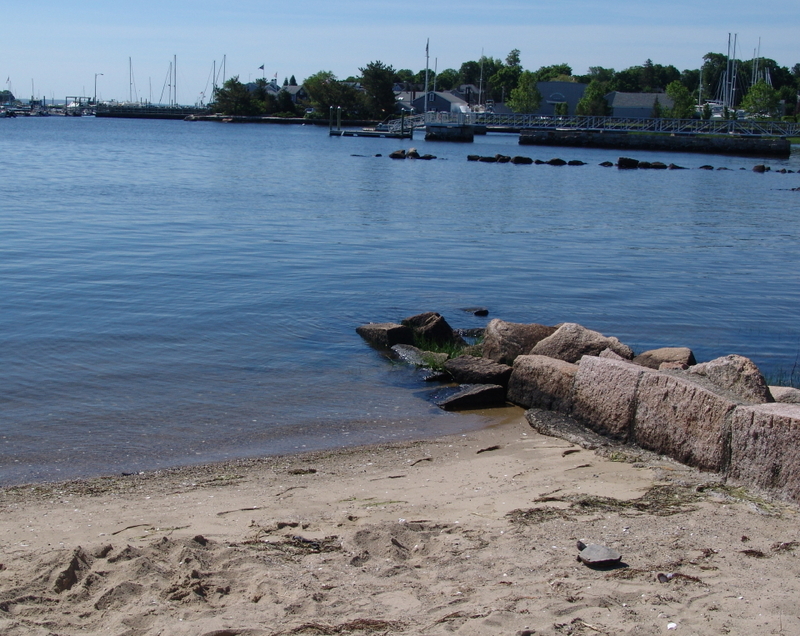 We first observed Stumpy in July 2005 as she came ashore to deposit her second nest of the season. We watched as she laboriously dug her nest and carefully placed 16 eggs in it. 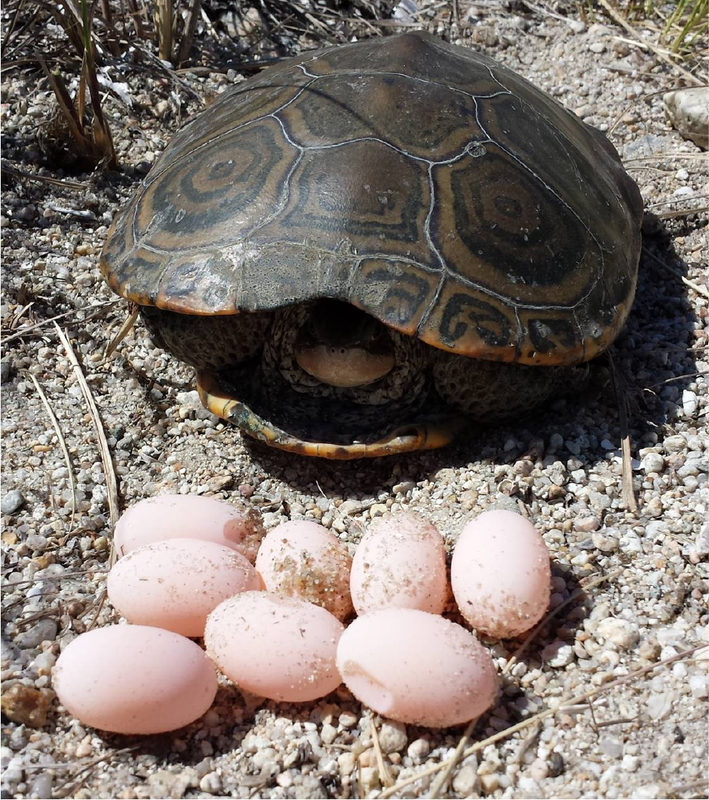 We harvested those eggs and relocated them to a protected area as part of a National Fish and Wildlife Foundation grant to conserve threatened diamondback terrapins. Turtle Journal has seen her nearly every year since that initial 2005 encounter, probably because her handicap increases her nesting time on land. Even with that challenge, Stumpy is a reliable nester and we’ve been proud to give her a helping hand by protecting her eggs and her offspring. 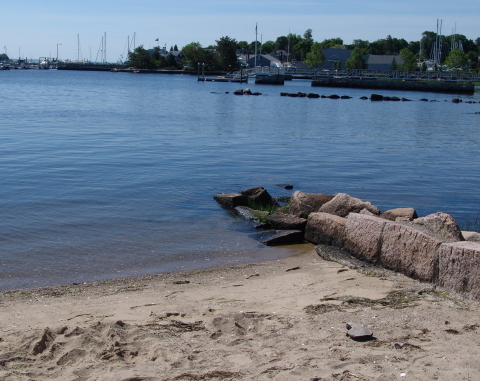 Stumpy crawled back across the tidal flats to return to Buzzards Bay. Hopefully, we’ll see her again in a few weeks as she comes back ashore to deposit her second clutch of the year. Michele Zollo discovered the first nesting terrapin at her Broad Marsh (Wareham) turtle garden on Wednesday morning, June 5th. Terrapin #821 is an overachiever and it’s hard to imagine how she can find room for all those eggs. We first saw this young lady in June of last year when she was only nine years old. Even then she already exceeded expectations with a 17-egg nest. Today’s 19 eggs hit the scales at 127 grams. 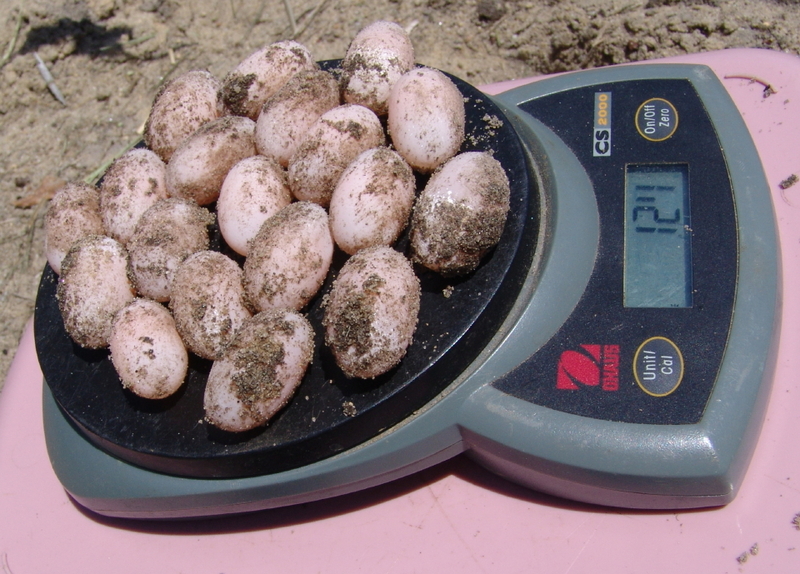 They are a bit on the small size with an average weight of only 6.7 grams per egg. 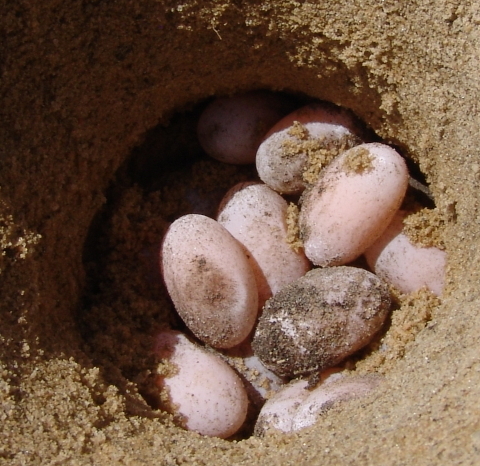 Terrapin #821′s ninteen eggs were relocated into a protected turtle garden, where Don Lewis sculpted the sand into a perfect simulated turtle nest. Michele and Louis Zollo created this turtle garden to serve as protected nesting habitat for diamondback terrapins in the Broad Marsh area of Wareham. They placed a predator excluder cage above the nest and encircled it with an additional chicken wire barrier to protect it from voracious predators. 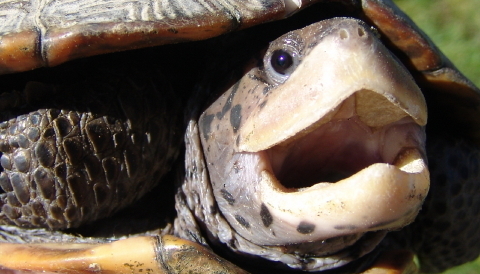 You are currently browsing the Turtle Journal blog archives for June, 2013.